The mole ploughing blade is pulled through the ground, cutting a channel of the required width and depth. The box chute is attached to the blade which enable the cables to be laid directly into the channel along with the sand surround and the specified system of protection. Due to the narrowness of the channel the ground closes in after the box. Moleploughing is one of the most rational and economic methods for laying cables and plastic pipes. 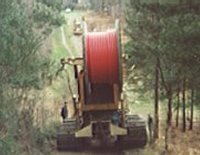 The cable-laying sections are able to simultaneously install a number of cables or pipes, including their hazard-warning tapes and screening conductors in an extremely careful way, accomplishing high daily performances. A trench is not produced, so there is no backfilling or disposal of spoil. Too: It is very easy to directly blow in cables into empty pipes installed by this cabling mole-plough, because they have a very even run.